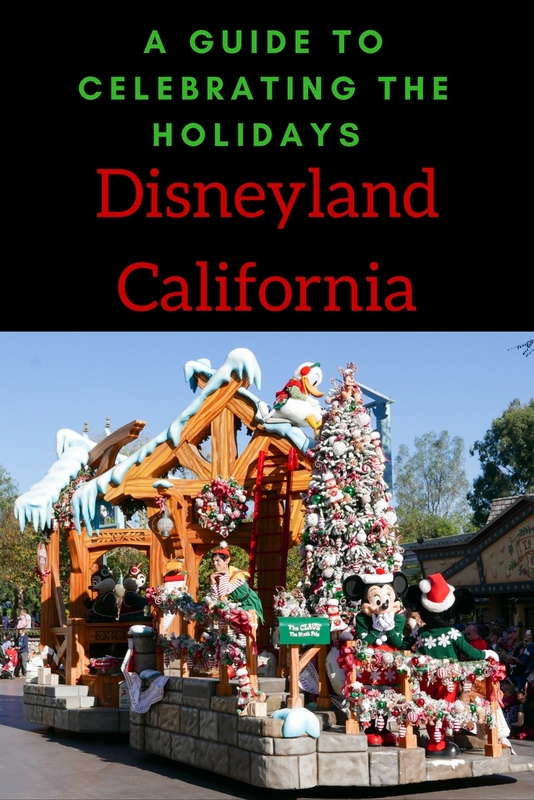 A Guide To Celebrating The Holidays At Disneyland - Adventure, baby! 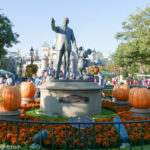 The most magical time of year at the happiest place on Earth is the period between November and January (check dates as they change annually), when the Disneyland Parks receive an enchanting makeover. 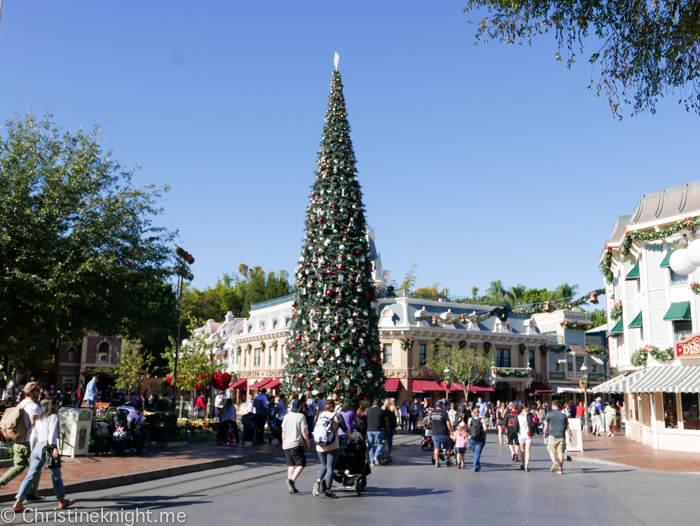 Celebrating Christmas at Disneyland is a must-do experience for young and old. 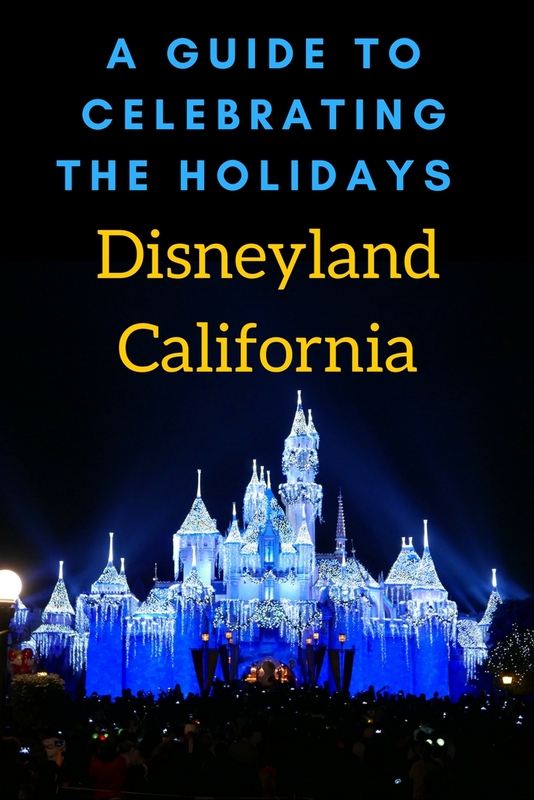 Visiting Disneyland at Christmas can be an incredible experience but also takes some planning and preparation. 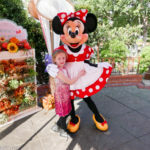 The tips in this guide will help you create a magical trip for your whole family. 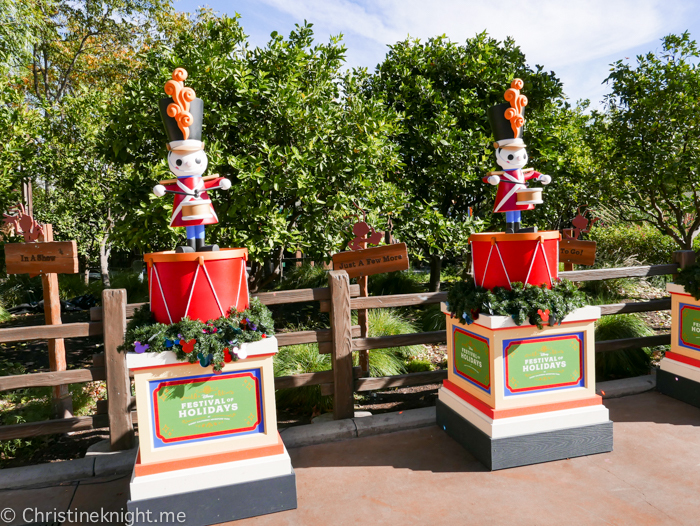 By very careful planning, we were able to avoid the bulk of the crowds who head to Disneyland to celebrate the holiday season. 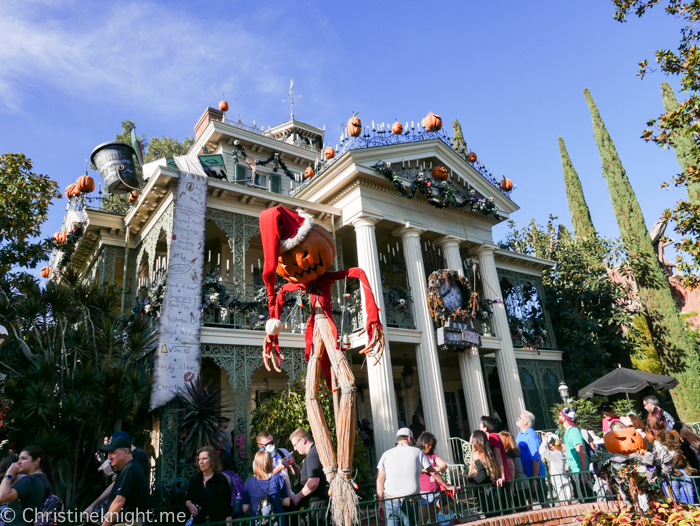 *Annual Pass Blockout Dates (obviously it’s good to go when annual pass holders can’t!). Check them here. *The busiest days according to the previous year on a calendar such as this. Weekends are always the busiest so I suggest avoiding them. We always book a very budget hotel that is extremely close to the park. 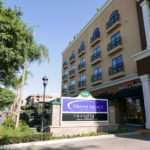 Our last trip we stayed at the Grand Legacy At The Park and found it to be extremely convenient. A full review of the Grand Legacy At The Park can be found here. My daughter is too big for a stroller this year, so I took a backpack to put in water, food and small purchases and keep my hands free. Clothes-wise, mornings and evenings can be cool at this time of year while the middle can be super warm. We were comfortable in jeans and tees during the day and added a light jumper/sweater for the mornings/evenings. 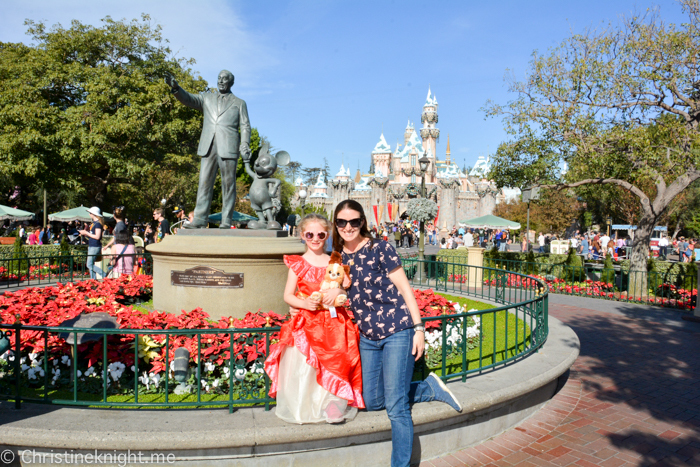 Shoes are so important at Disneyland when you’re walking 22K steps a day: go for comfort! My daughter and I wore extremely comfortable sneakers ever day. If your kid fits into a stroller then by all means take one or hire one from the parks. I saw kids who were aged seven in them being pushed around, so there’s no shame in it if it’s what you need to do to get the kids through the long days without tears. 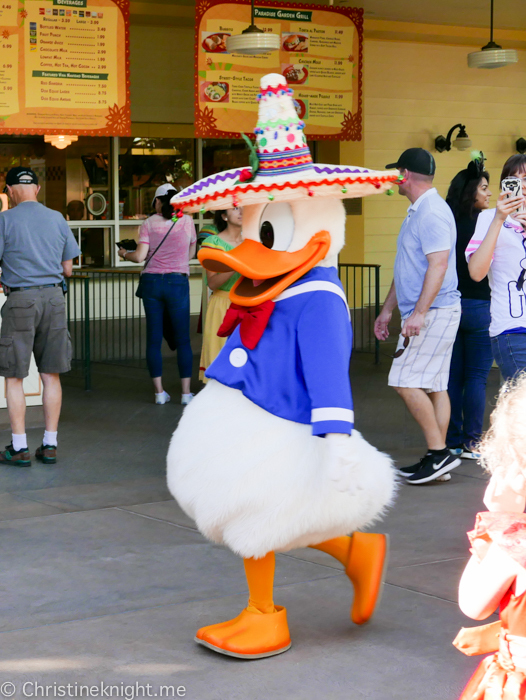 It’s invaluable for planning your day – character meet-and-greet times and locations, show times, ride wait times, view and make dining reservations, see your Disney PhotoPass pics, and even buy your park tickets app. Plus it’s a must-have if you’re planning on upgrading your ticket to include a Maxpass (the below). 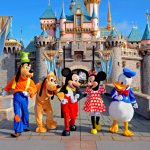 Get more info on the Disneyland App and download it here. 2. 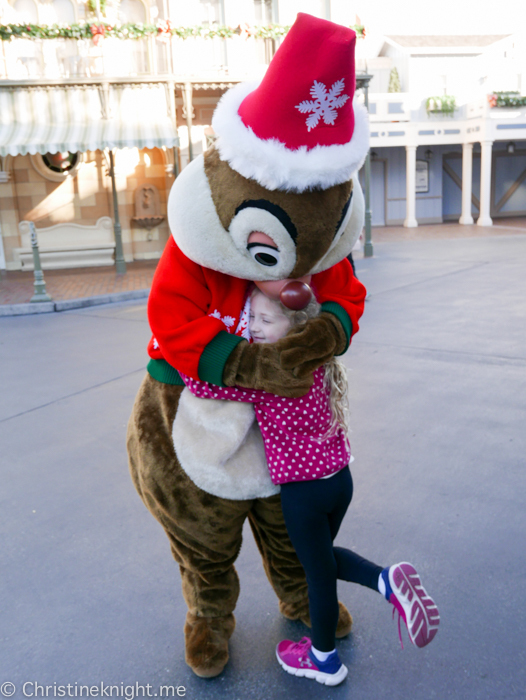 Provides access to download all PhotoPass images taken by Disneyland photographers each day. If you like to get lots of photos taken then the Maxpass is fantastic value for the photos alone. 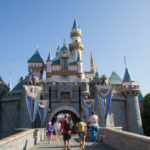 While you can still get FASTPASS without a Maxpass, it does require walking a lot more all over the park to get the paper ticket from the machine and then return again later. 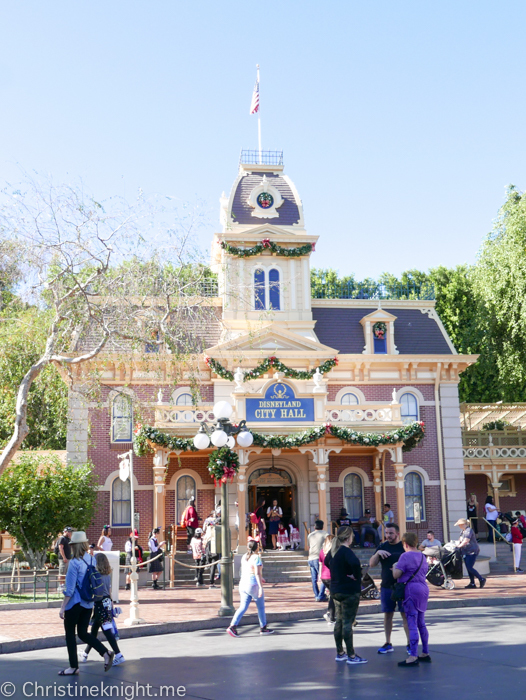 A Maxpass lets you book your FASTPASS selections on your phone from anywhere in the park. It was a game changer for us. 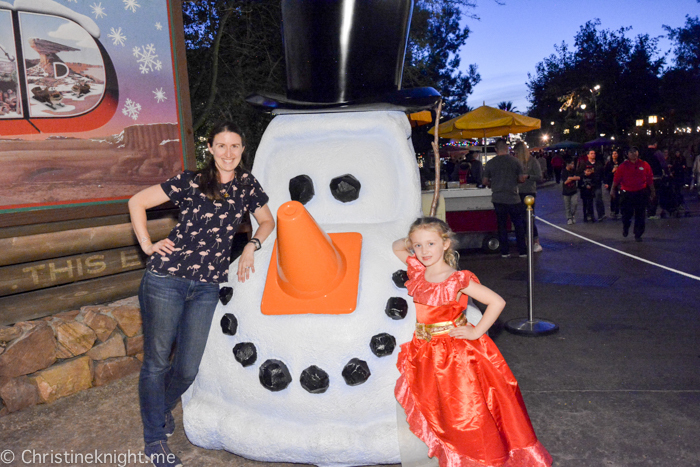 Only one member of your party needs to purchase the Maxpass if photos are your goal rather than digital Fastpasses. 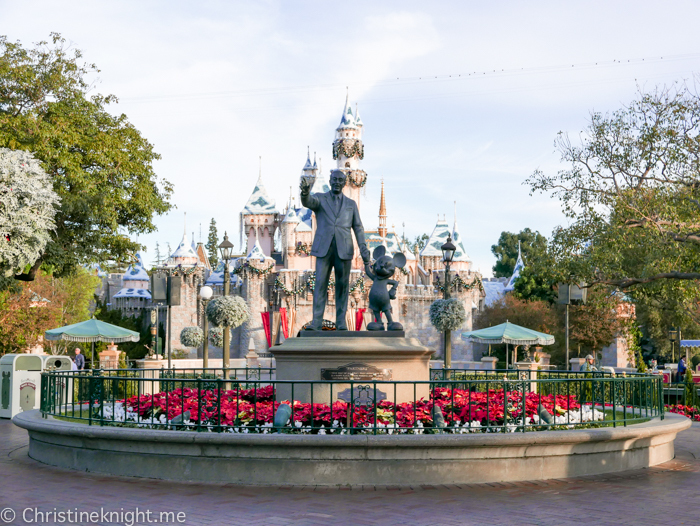 I’m a big believer in schedules, particularly at Disneyland where timing is important. 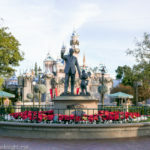 I created a spreadsheet in advance and researched the events that would be taking place each day, such as parades, fireworks, shows, character meet-and-greets, tree lightings and so forth, to slot them into the time we had at the parks. Not a morning person? 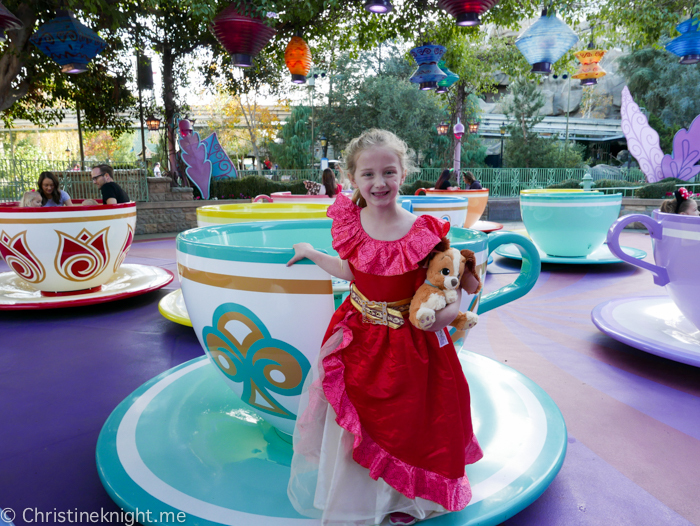 Your experience at Disneyland will be vastly improved if you are! Mornings are the best for rides as it’s when the parks are quietest, so we would arrive each morning between 7 and 7:30am and be one of the first few people inside the park when it officially opened. This meant we had from 8am-11am each day with basically no queues for rides as a result, and used the Maxpass to schedule the top rides for throughout the day to get them in several times. 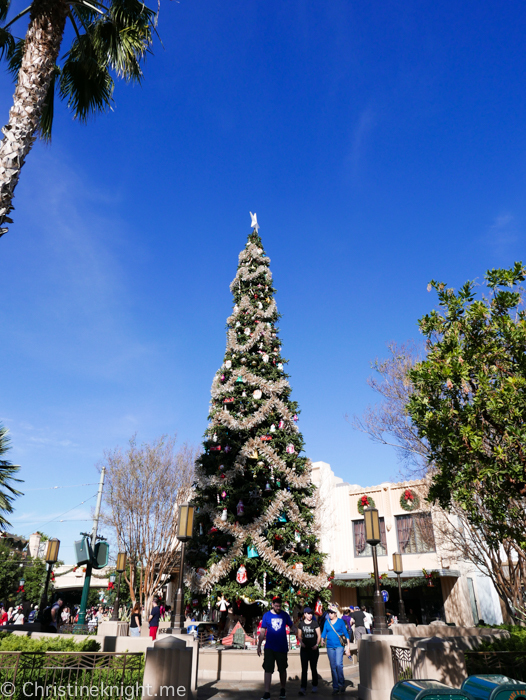 Take a break for lunch in the middle of the day to early afternoon, and then enjoy the special Christmas entertainment. 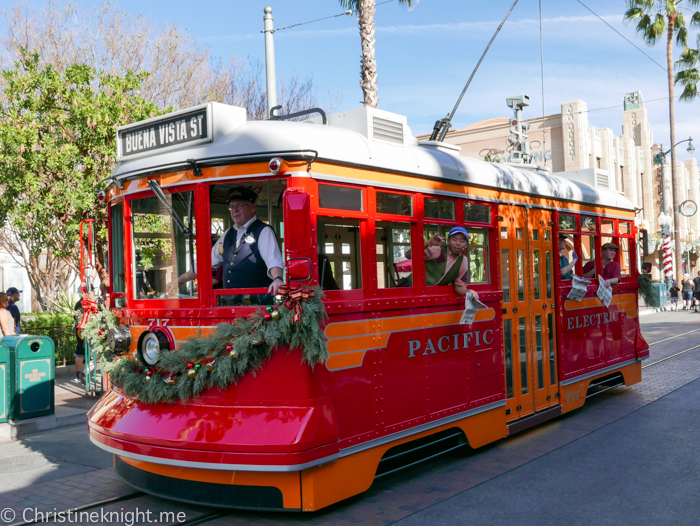 Both parks feature a stunning 50-foot-tall Christmas tree, wreaths, baubles, and more, festooning the lampposts, rooftops and window displays. 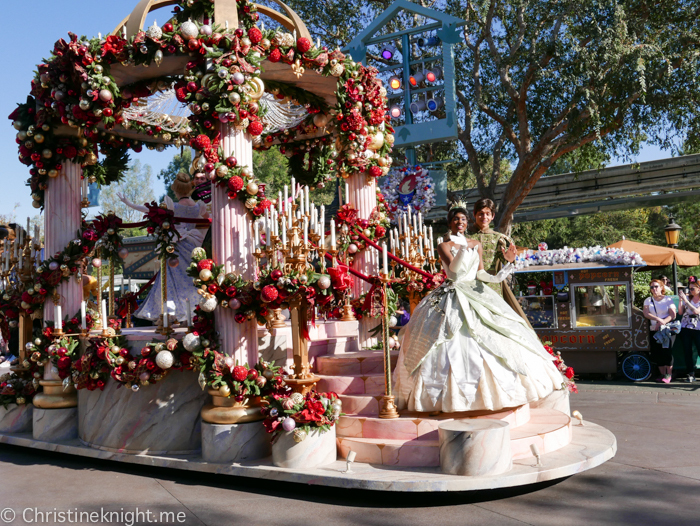 Two of the Disneyland’s rides get a holiday makeover as well: The “It’s a Small World” ride is lit by over 50,000 lights and video projections, while the Haunted Mansion is taken over by the cast Tim Burton’s The Nightmare Before Christmas, including Jack Skellington. 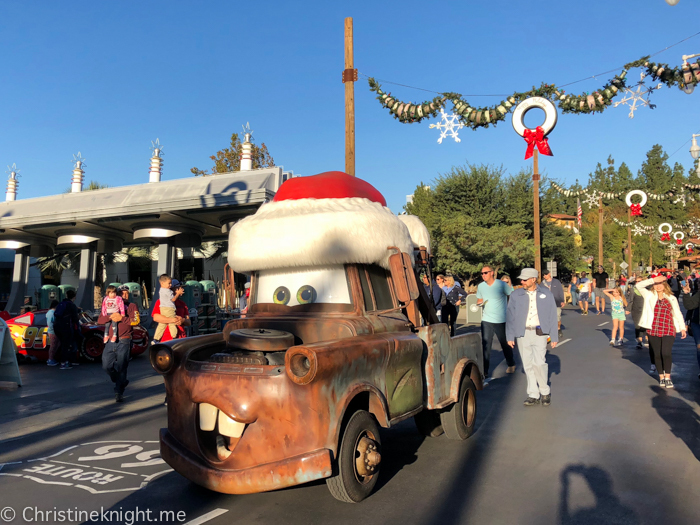 The town of Radiator Springs (AKA “Cars Land) in Disney California Adventure Park was given a makeover on our recent visit, including the actual cars themselves, plus the ride Mater’s Jingle Jamboree. 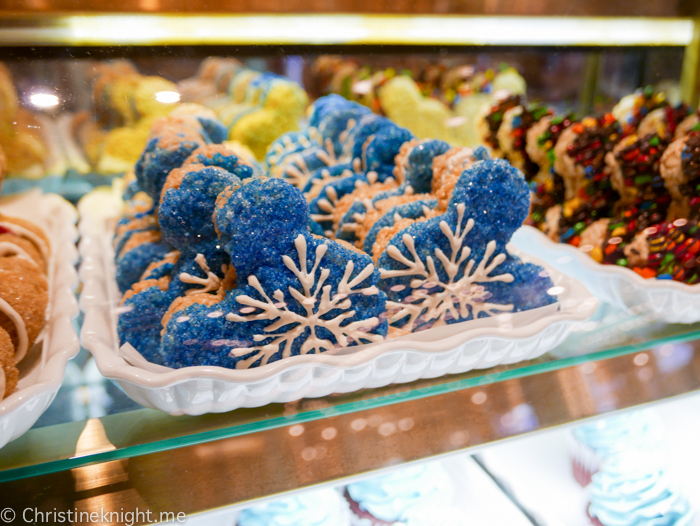 If you get time, check out the lobby of the Grand Californian Hotel, which is decorated beautifully for the holidays. 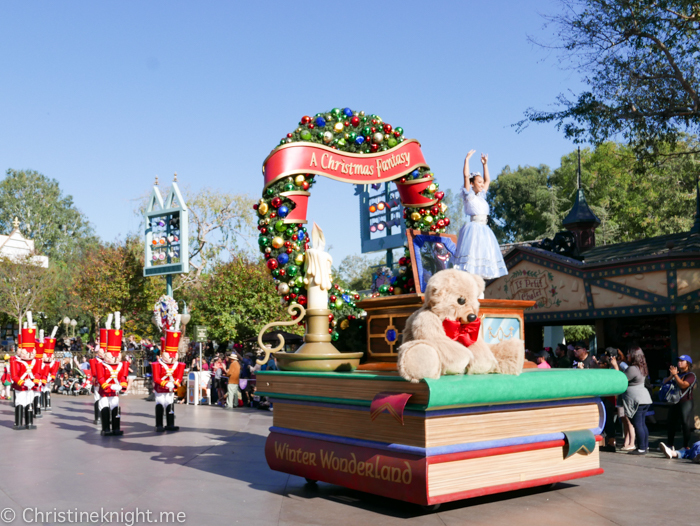 Disneyland has a twice-daily Christmas Fantasy Parade (check the Disneyland website closer to your visit to check parade times) featuring traditional Disney characters plus Santa, dancing gingerbread men, prancing reindeer and twirling snowmen. 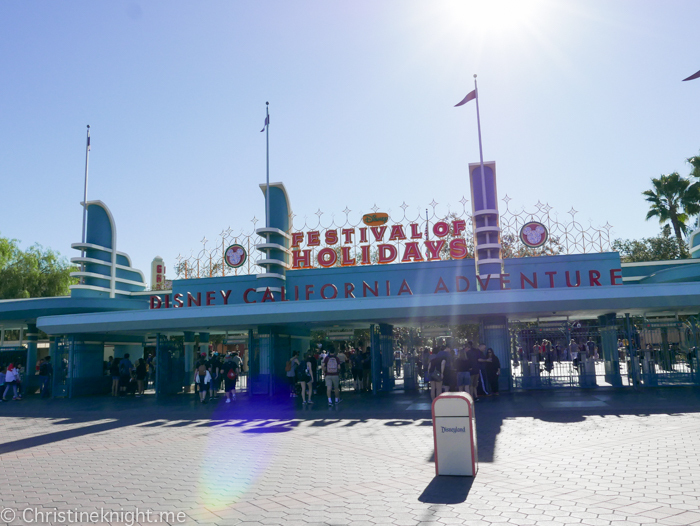 We also highly enjoyed the Disney Festival of Holidays at Disney California Adventure Park, which featured seasonal celebrations from around the world. 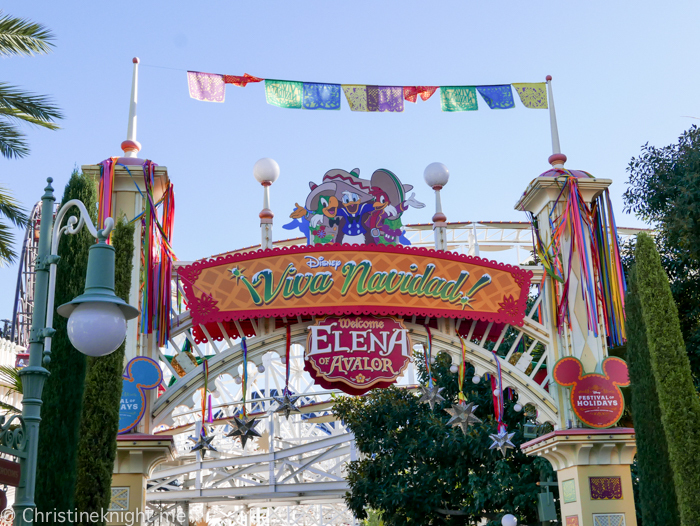 Our particular favourites were the Disney ¡Viva Navidad! 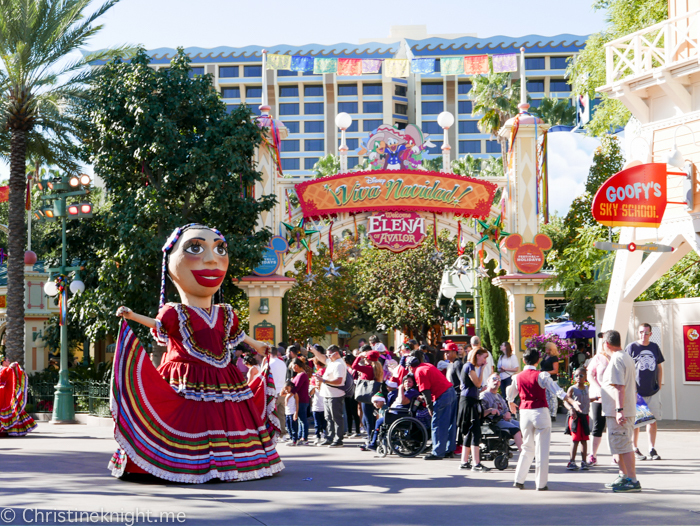 Street Party, where mariachi and samba musicians and 12-foot-tall mojiganga puppets took to the streets, as well as Princess Elena of Avalor’s Grand Arrival, where Elena arrived on a float several times a day and sang her famous songs live. This was my daughter’s favourite live show of our trip. 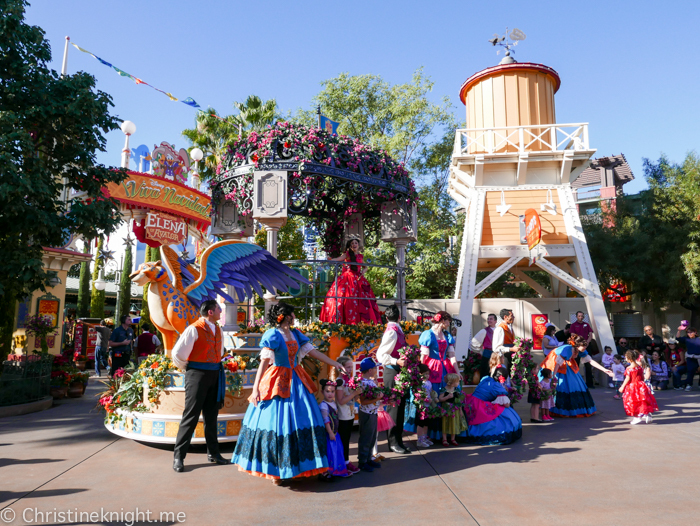 Watch out for fun roaming entertainment in both parks, such as the drummers in California Adventure Park and carol singers in Disneyland. 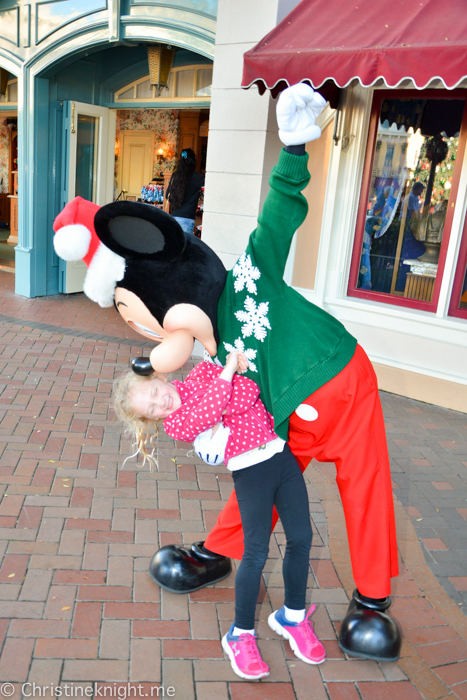 The festive fun is literally around every corner. 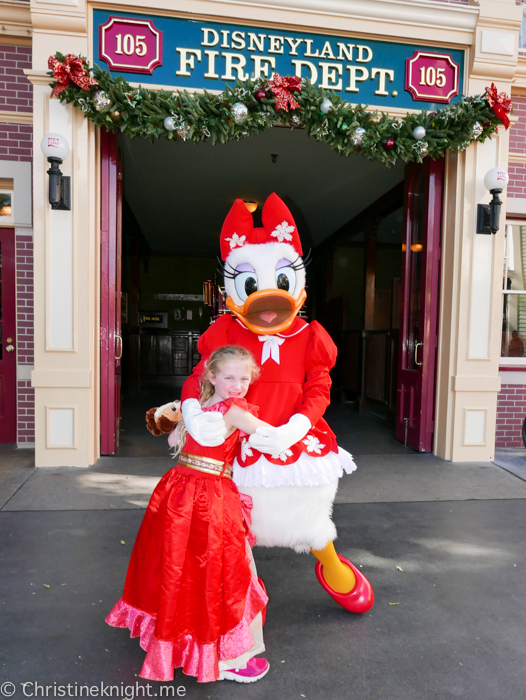 We love meeting the characters anyway, but they’re that little bit extra special when dressed in holiday garb! We brought an autograph book with us (it’s a great ice breaker) and hunted down our faves throughout the day. 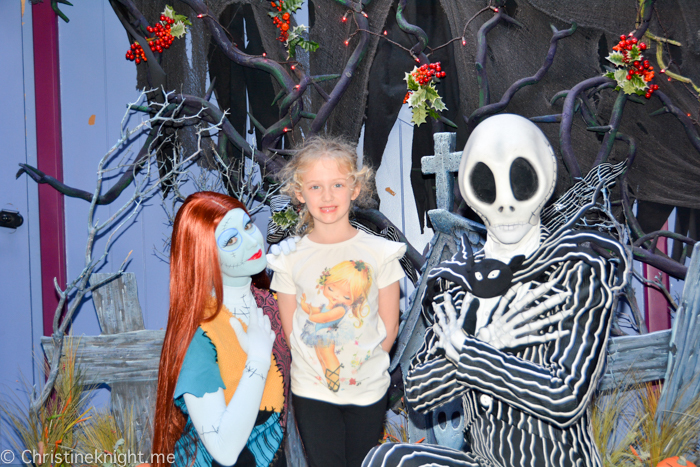 We especially loved Mickey and Minnie in their festive clothes, meeting Jack Skellington and Sally from Tim Burton’s The Nightmare Before Christmas and watching the Disney characters dance in their ¡Viva Navidad! attire. 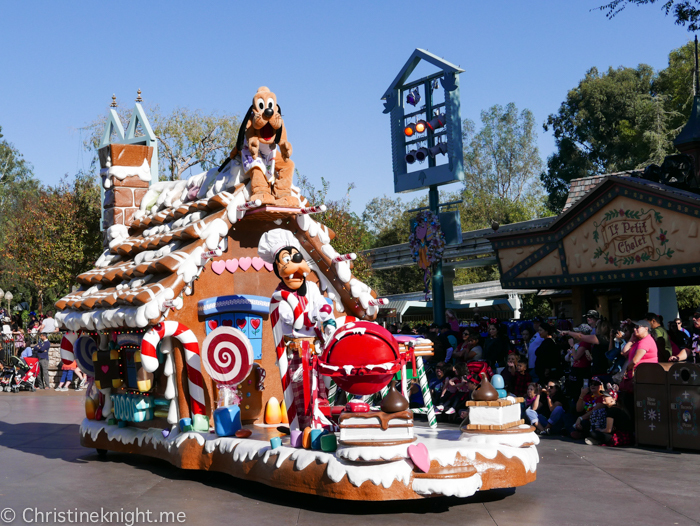 You can locate the characters using the Disneyland app on your phone. 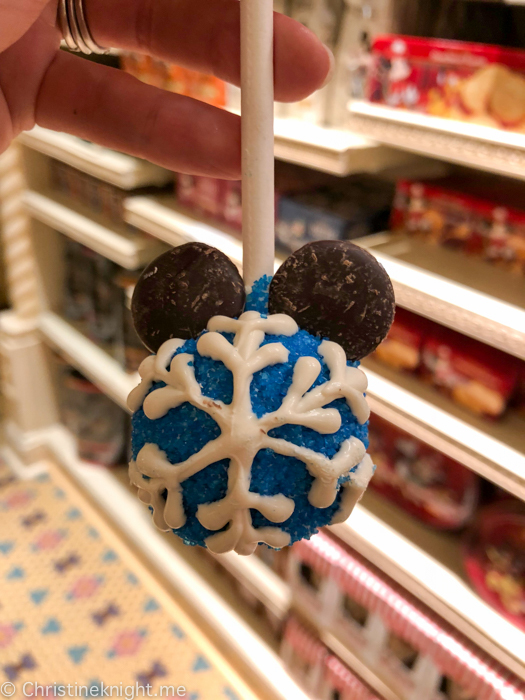 The Disney Parks employ a wide variety of exceptional pastry chefs and confectioners, so I highly recommend trying some of their seasonal treats. 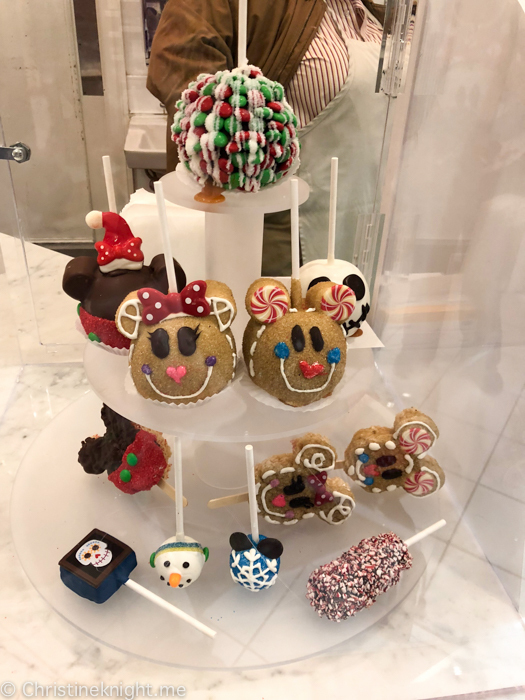 Disneyland Park features peppermint Mickey Mouse beignets, festive candy apples, gingerbread men, snowman-shaped cookies, snowflake and Jack Skellington cake pops, and handmade candy canes that take three hours to make each batch. 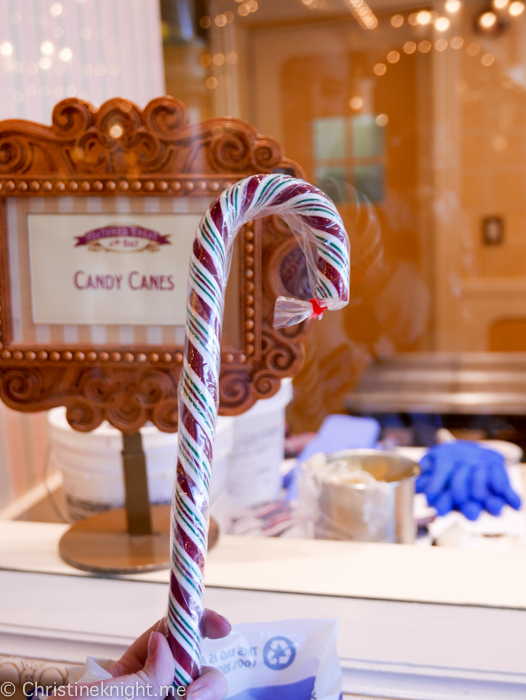 Watch them being made on Main Street; it’s mesmerising! 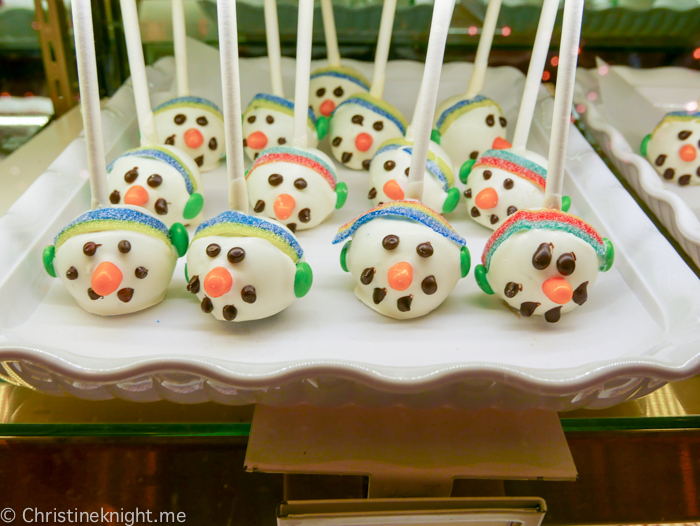 Disney California Adventure Park has a large Festive Foods Marketplace where you can try holiday favourites from around the world. The popcorn is a fave of ours (for some reason, it tastes really amazing!) 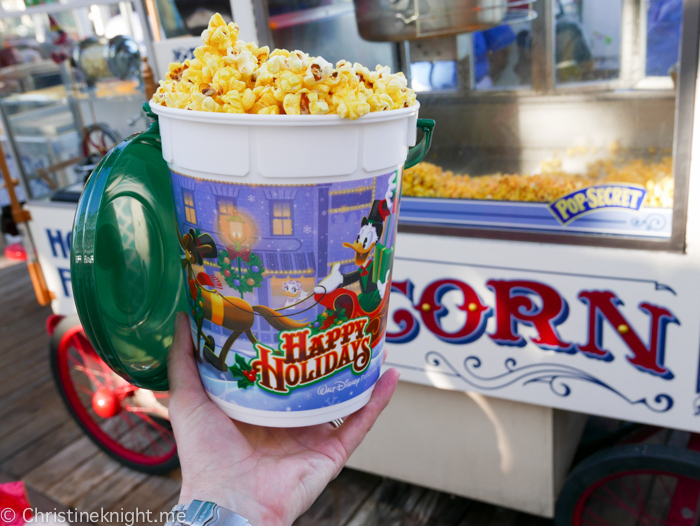 and we love to pick up a holiday-themed or limited-edition popcorn bucket to take home as a souvenir. 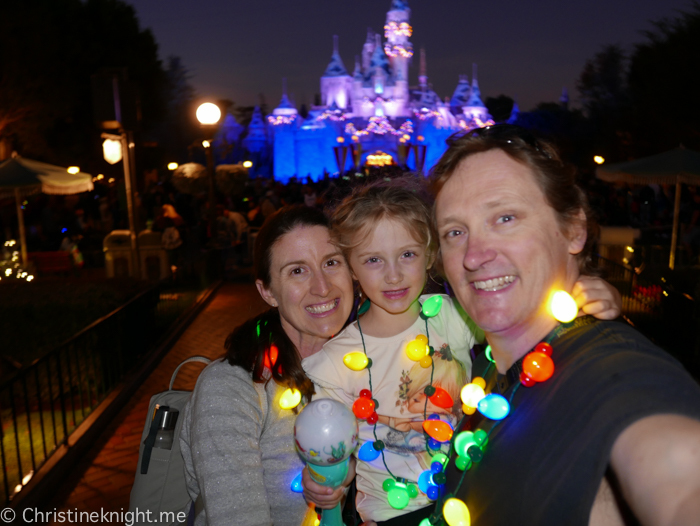 Since we are such early birds at the park, we rarely make it to evening and always miss the nighttime lights. The benefit of visiting at this time of year is that sundown is earlier so the lights come on earlier, and we get to see the magic before bedtime! 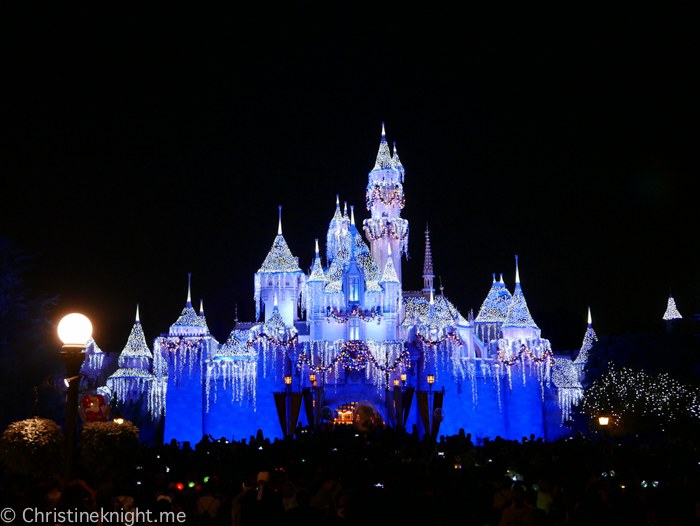 The earliest display to watch is Sleeping Beauty’s Winter Castle which, at 6pm each evening, transforms into a shimmering display of 80,000 lights. Dazzling to watch! 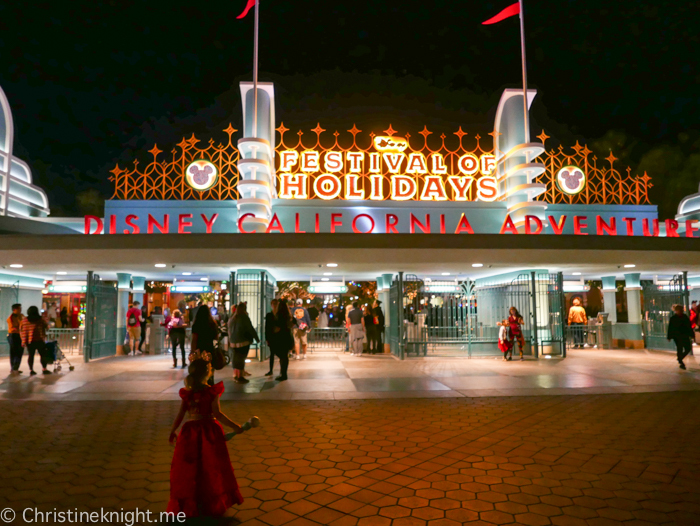 The “Believe…In Holiday Magic” Fireworks Spectacular in Disneyland Park and World of Color – Season of Light in Disney California Adventure Park, which is a a show featuring videos projected onto screens formed by fountains. 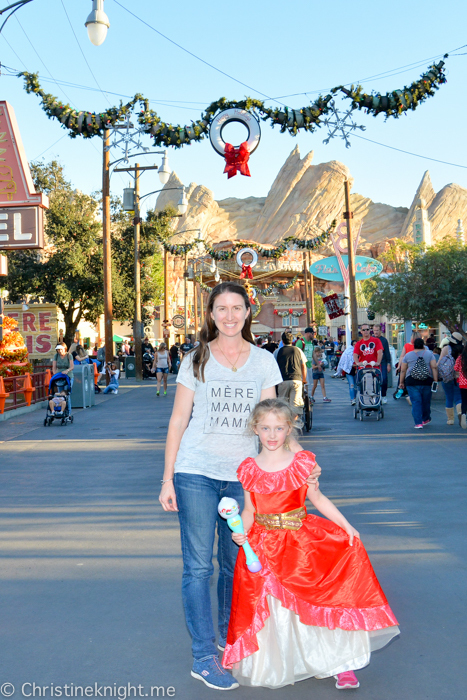 Our time at Disneyland was magical. I would go every year if I could. 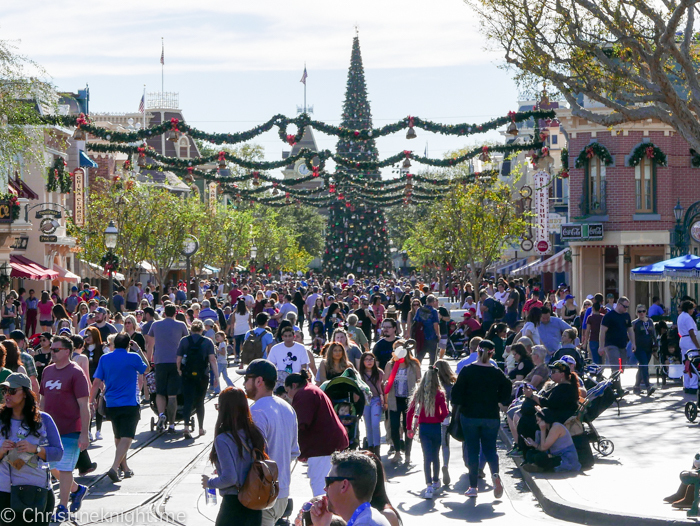 The crowds weren’t as bad as when I have visited previously in summer (note: this might be because I planned the days we visited so carefully), and we found the temperature perfect for long days at the parks. I highly recommend this experience to families of all ages. 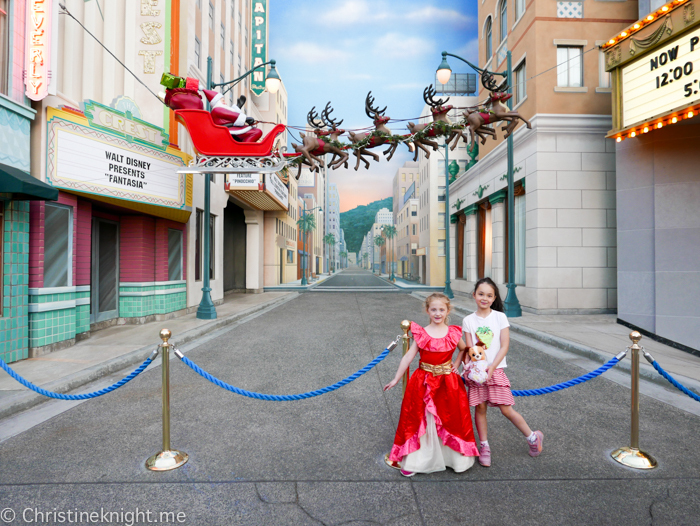 We received Disneyland Park tickets courtesy of Disney. All opinions our own. We are life-long lovers of Disney. Christine is the editor of Adventure, Baby! 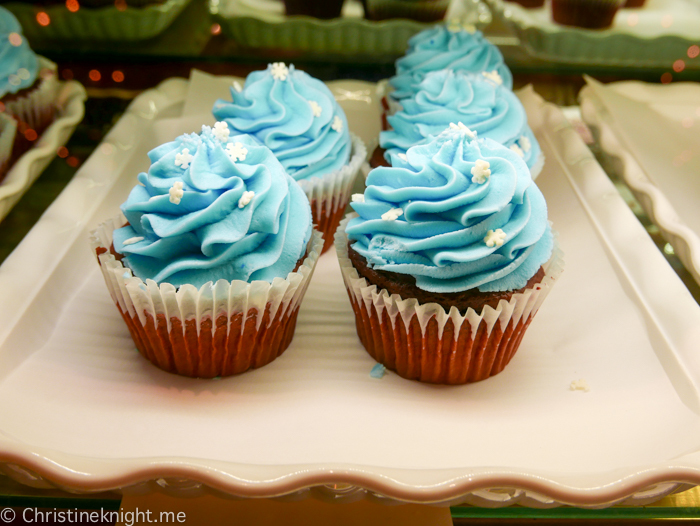 I love to travel, eat cake, photograph my child and dream big. Welcome to my site! Thanks for supporting Adventure, baby!